Exotic kiwifruit, also known as Chinese gooseberries or simply "kiwi," is a favorite flavor of Ben & Jerry's ice cream fans. Even for kiwifruit-lovers, kiwi-flavored ice cream is certainly not common, but it should be. With only five simple ingredients, this ice cream is bound to be a favorite among children and adults alike. This homemade ice cream recipe calls for tender, ripe kiwifruit to be mashed or puréed and made into a rich and creamy ice cream. 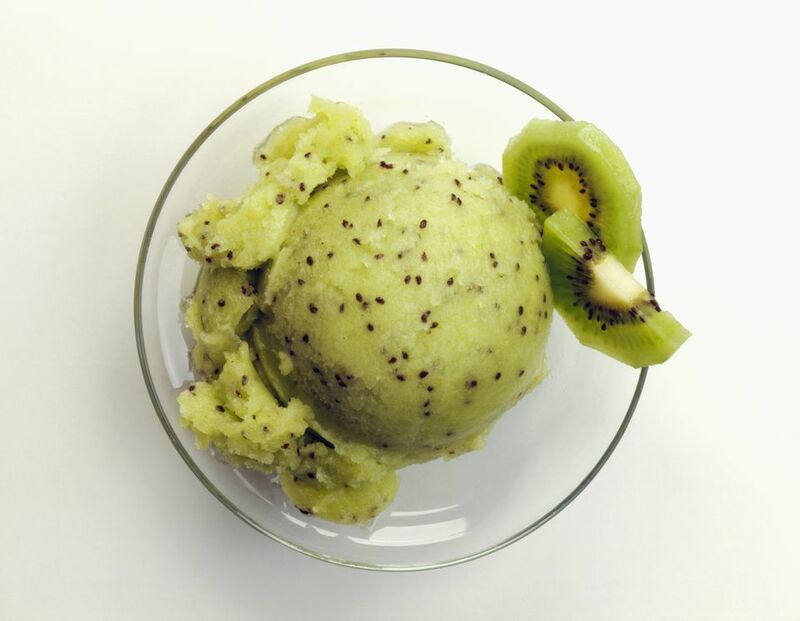 Using the whole fruit, save the brown fuzzy skin, lends this ice cream a bright green hue with a sprinkling of dark black seeds characteristic of fresh kiwifruit. Peel the kiwifruit either with a vegetable peeler or knife and mash them in a bowl until pureed. Stir 2 tablespoons sugar into the fruit, cover, and refrigerate 1 hour. Whisk the eggs in a mixing bowl until light and fluffy, 1 to 2 minutes. Whisk in 1 cup sugar, a little at a time, then continue whisking until completely blended, about 1 minute more. Pour in the cream and whisk to blend. After 1 hour cooling in the refrigerator, stir the kiwifruit into the egg, sugar, and cream mixture. *Ingredient Note: Though in the United States kiwifruit have been known to be called ​kiwi, kiwifruit was, in fact, the fruit's full marketed name. Native to north-central and eastern China, kiwifruit were originally called Chinese gooseberries. But in the 1960s in an effort to market the juicy, green fruit in the west, kiwifruit farmers in New Zealand re-named their fruit to represent their country using the name kiwi, which is the name of the New Zealand national bird as well as a common nickname for New Zealanders themselves. Ben & Jerry's is the world-famous ice cream brand headquartered in Vermont. With flavors like Chunky Monkey and Phish Food, Ben Cohen and Jerry Greenfield have made a name for themselves in the ice cream world. While their ice cream is available in ice cream shops across the country, they are perhaps most famous for their take-home pint-sized ice cream cartons. But the two ice cream entrepreneurs didn't stop there. In their best-selling cookbook, Ben & Jerry's Homemade Ice Cream and Dessert Book, the two have brought ice cream fans delicious dessert recipes they can make at home along with stories about their friendship and company's founding. From Ben & Jerry's favorites like New York Super Fudge Chunk to fresh fruit recipes like this kiwi ice cream, this cookbook has it all for ice cream lovers.